Tymal Mills’ left-arm thunderbolts finished the match with a thrilling hat-trick and Rashid Khan, their mesmerizing Afghan leg spinner, took 3 for 9 in three overs as Delray Rawlins and his Sussex teammates produced a near-complete all-round performance under the The 1st Central County Ground floodlights to defeat Glamorgan by 98 runs. 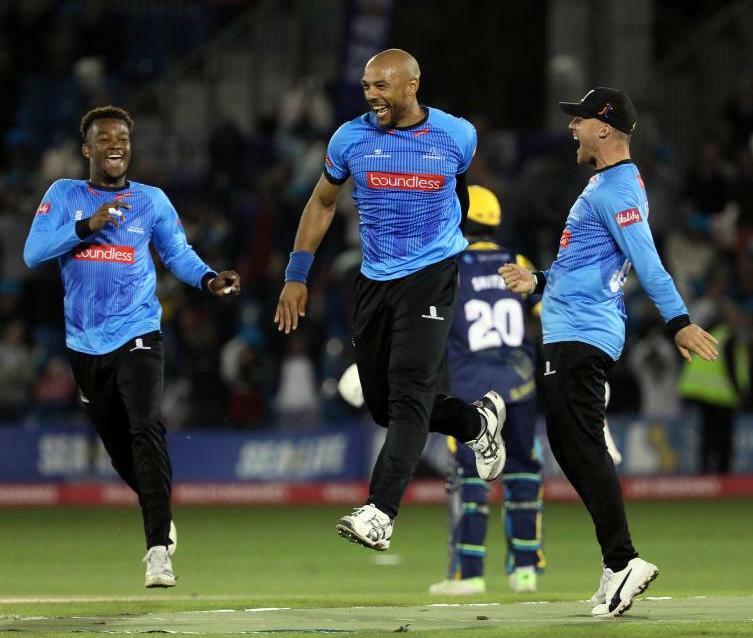 The victory keeps alive Sussex’s hopes of quarter-final qualification from the fiercely-competitive Vitality Blast south group, and pushes them into fifth place on 14 points, ahead of Surrey and just one behind Glamorgan. The Welsh county now have just one game to play in the group stage, against leaders Somerset, while Sussex have two more matches to play. Sussex’s win, only their fifth from 12 games in a campaign so far blighted by four No Result wash-outs, was packed with explosive hitting from Laurie Evans, Rawlins, Michael Burgess and Jofra Archer, a couple of spectacular catches plus high class pace and spin bowling from Mills, Archer, Chris Jordan, the slow left-armer Danny Briggs and, of course, Rashid. Sussex’s total of 186 for 5 was built on Evans’ 63 not out off 46 balls, Rawlins provided some forthright blows in a 20-ball 35, Rawlins hit 4 fours and 1 six.